Will your furnace last another winter? If it’s a few years old, you might not be sure. What you do know is how disruptive a furnace breakdown can be, especially in the middle of the holidays while in-laws are visiting. Decrease the chance of furnace failure this winter by following these tips. A furnace is most likely to fail when you need it most. Avoid inconvenient breakdowns and emergency repairs with a preventative furnace inspection at the start of the heating season. Your expert technician will check the electrical wiring, inspect valves for leaks, clean the burners, lubricate moving parts, inspect and replace the fan belt if needed, and perform other tasks that set up your furnace for a failure-free season. This is something your heating technician will do during a furnace inspection, but be prepared to change the filter again in a month or two. If you neglect this task, the filter could become so clogged with hair, dust, fibers and other debris that airflow is restricted to a dangerous level, causing your furnace to overheat. A quick air filter replacement is the easiest way to prevent this. Some homeowners attempt to save money by closing off and shutting the vents inside rooms they seldom use. However, closing too many vents throws off the delicate return/supply air balance and overworks the heating system. As a result, your furnace is more likely to break down. To prevent this, keep at least 80 percent of the vents in your home open and unblocked at all times. You might be tempted to ignore your furnace when it starts acting strangely, but delaying a furnace repair could lead to a total breakdown and a more expensive problem to fix later on. The sooner you put in the call to a repair technician, the better chance you have of restoring normal operation without suffering in the cold for a night or two. Signs of imminent furnace failure include funny smells, strange sounds, difficulty starting, fluctuating performance and rising energy costs. If your heating system is more than a decade old, and it struggled to keep your home comfortable last winter, this could be the year to replace it. 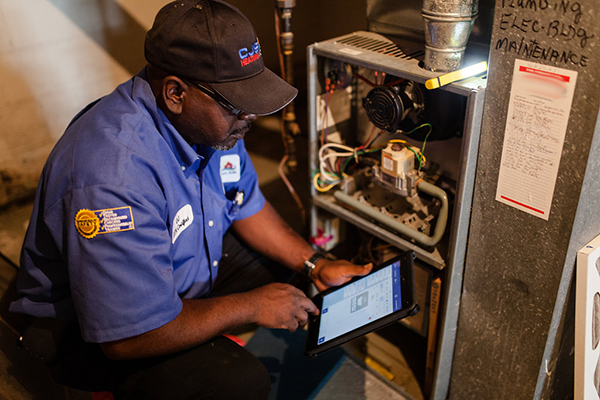 Browse your furnace replacement options now so you can make the upgrade before an inconvenient breakdown occurs. Once your new furnace is installed, be diligent about maintaining and operating it correctly to help it last for many winters to come. The experts at CJS Heating and Air are here to help you prevent furnace failure this winter. Whether you need to schedule a furnace inspection or repair, or you think it might be time for a furnace replacement, we can help. The next time you need heating services in Columbus, OH, please contact us.